Fraternities and Sororities account for 9 million people in the U.S., making up quite the mass. If you choose to be involved, there are several ways to leverage greek life in your career. This can be when submitting your resume, interviewing, or networking. We talked to Dani Weatherford, Executive Director of the National Panhellenic Conference, which is the umbrella organization for 26 international sorority chapters, as well as Megan Pepper, Director of Fraternity and Sorority Life at the University of Nevada, Reno. Both gave advice on how to use this membership to help you get the job out of college and continue down your desired career path. See also: the Peterson’s Podcast You Have a Cool Job, Episode 1. First, let’s cover the common different types of fraternities and sororities, because they aren’t all the traditional social organizations you think of first. A few things they all have in common: allow for networking opportunities, offer lifetime memberships, and provide some sort of community service work. Most also have requirements to membership. Social – Typically a single-gendered social organization that creates smaller communities within college campuses for students to make friends and other contacts. Requirements vary between organizations and campuses, but all have some sort of recruitment process to admit members. Multicultural – While this is also a social organization, multicultural sororities and fraternities promote and focus on cultural diversity. These organizations are also typically single-gendered. Multicultural greek life organizations usually have a less formal recruitment process than traditional social greek life. Professional – These organizations are not usually single-gendered and are focused on professional development for a particular field such as business, art, law, etc. Requirements are typically straightforward and outlined by the organization. Honorary/Academic – Similar to professional fraternities and sororities, members are usually comprised of all genders and are focused on their academic studies and achievements. These aren’t called greek organizations on all campuses and instead are called honor societies or programs, but some campuses utilize these as specific greek life organizations. Requirements are typically straightforward, also similar to professional organizations, and have a GPA requirement. Service – Service fraternities and sororities’ primary focus is on community service. Similar to professional and honorary organizations, members are interested and passionate about community service and want to develop leadership skills. Note: professional, honorary/academic, and service chapters usually aren’t exempt from Title IX requirements as social organizations are, which is why they typically do not include a gender basis. However, we all know social greek life sometimes gets a bad rap. Due to this, young professionals are often unsure of how to disclose and present this membership in the professional world. In order to get the most out of your affiliation professionally, start by evaluating what skills you learned that are relevant in the professional world. 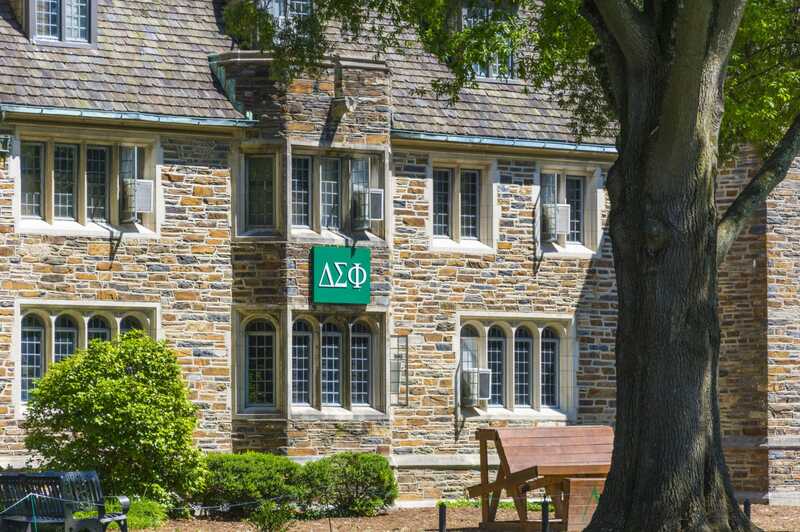 “Most of our members join the women’s only sorority as an undergraduate, and so it is part of that undergraduate experience where they’re building the network, they’re developing leadership skills, they’re focusing on experiential learning – that learning that happens outside of the classroom – and the sorority experience offers all of those things,” said Weatherford. Aside from the base level social and networking skills, greek life offers many leadership development opportunities. Officers volunteer for leadership roles and are often elected to certain positions. These roles vary in responsibility. According to Weatherford, a treasurer may manage a chapter budget as expensive as $1 million annually, while a chapter president could be managing anywhere from 25-300 members in a year. Other roles, such as single event or activity planners and managers, carry less responsibility, but still teach leadership, planning, and management skills. These roles can also help members find professional passions and interests. “That experience teaches young women how to collaborate and work with people from different perspectives, how to manage conflict, all of those things that come from working with one another. And those particular skills are so helpful when a young woman enters the workforce,” said Weatherford. This opinion seems to be common among greek life leaders, as Pepper also described relevant skills. “A lot of [members] get real world experience just by managing day to day operations of the organization, interactions between peers, budgeting, programming, all that. So I think they get a lot of transferable skills,” said Pepper. Pepper also explained the various programs put on for greek members that help with professional development. This may come from the on-campus all-greek program or from specific chapters and groups. “There’s a greek alumni council that does make connections sometimes and likes to come around to some of our different events when we’re doing programming that’s related to professional development. But there’s also some local alumni groups in the area that do quite a bit with their local collegiate chapters so lots of our college chapters will often put on various events,” said Pepper. At UNR, these events include alumni coming onto campus to talk about their careers and connect with students, participate in professional development panels, attend networking events, lead resume workshops, and perform mock interviews. You are also usually able to join both a social chapter and a professional, academic, or service chapter. This can further prove your skills in a specific area and give you the benefits of both backgrounds as far as acquiring relevant skills. On your resume, Weatherford’s advice is to capitalize on those skills. Deem what header on your resume is appropriate for your greek affiliation to fall under. This may be under the interests, experience, leadership, or activities section, depending on your position. Put the name of your organization with your position (if applicable), and detail in a sentence or a few bullet points what your duties were and what skills you acquired. “I think that [explaining your membership role] can be done easily and succinctly with a few bullet points about the numerous people led, the number of dollars managed, the different officer roles that an individual had, the number of dollars fundraised, the types of activities that a person managed. Those quantifiable activities or successes can go on the resume and can easily indicate to an interviewer what that meant to a person,” said Weatherford. While facts and quantifiable achievements are important for the resume, explaining your experience in an interview will further elaborate. “The best way to explain it is by utilizing examples. I don’t think there are a lot of places where you manage your peers as much as you do with fraternity and sorority life, so I think a lot of [greek life members] have quite a few examples of skills that they have learned within the position. And then if they’re able to talk about how they can transfer the skills to the job at hand, then I think that’s what would make students most successful in terms of explaining what they’ve learned and how it will impact their ability to do the job,” said Pepper. Weatherford also said she encourages young people to make memberships very visible on the resume as talking and recognition points. As greek life includes so many Americans and is highly recognizable, this will very likely be something a potential employer or interviewer will want to ask you about whether the individual is personally familiar with greek life or not. It is also likely that someone in the company or organization you are applying for is a member. “There’s an automatic way to connect there,” said Weatherford. As for drawbacks? Some people will advise not to include greek life affiliation on your resume when job searching due to poor reputations of a particular campus or negative opinions of greek life as a whole. However, Weatherford recommended against this. “My recommendation is to always include it. In my time as a young person looking for a job, I had several folks who worked at the schools that I was attending who did mention to me not to include it. If I had followed that advice and not included it on my resume for [my] first law firm job, I probably wouldn’t even have gotten that job. For my personal experience, I think it is something always worth including on a resume because the experience is so invaluable,” said Weatherford. Networking might be the most obvious factor of such a large body of people. While you connect with your peers and build relationships in that way, you also are able to connect with alumni. “Whether you, as an undergraduate woman, are looking to connect with alumni of a particular member organization or all of the sorority world as a whole, there are always women who are interested in providing mentoring and making connections, helping other young women who are in school or have just graduated find new connections in new cities, with new job opportunities, and with volunteer opportunities,” said Weatherford. Of course, while Weatherford talks specifically about sororities, these connections and alumni relationships are applicable to fraternities too. Weatherford explained the lifetime membership aspect as a partnership between college students and affiliated members that have graduated from college. These alumni range in age from recent graduates to elderly men or women, and may participate in varying levels of involvement post-college. Weatherford also remarked that there is recognition among the community as a whole that applies to the workplace. She recalled her job search for an interview at a law firm while she was a law student. “The one [firm] where I was offered a position and took a position, was one with several partners who were members of greek organizations of men and women. They very clearly understood what the experience meant because they had had one,” said Weatherford. If you choose to be in a greek life organization of any kind, make the most of your experience and utilize the available professional development and networking tools to further your career.